Last night, Shade and Mayan both had pre-school jitters. Aitza had to hang out in their bedroom for ages until they went to sleep. Mayan’s worries are based on no real problem. He couldn’t even put his finger on it. He ended up blaming it on the eventual FCAT writing test that he would have to take later in the year. Go to bed, Mayan! Shade, on the other hand, was fretting about being accepted and whether he would have any friends. But this morning when Aitza took him, he was getting high fives from a bunch of students so I think he simmered down a bit. I’ll simmer down when I find out he’s actually doing okay. Last year was a gimme for his classes, but this year I think he’s going to have a bit more pressure to perform. The good thing is his memory has improved over summer. But it’s not up to 8th grade level yet. That may take a while. When I picked up Shade at 2:10 p.m. to take him to therapy, he was worn out. He still gets very fatigued from long thinking sessions. (Must be a family trait. My brain sparks and whizzes when Aitza asks me more than two questions in a row.) He’s taking science, history, art, two math courses and a student assist class in which one of his peers helps him study. Unfortunately the chorus class had to go. It was seventh period and he would have missed it because of therapy. Aitza took Shade to community choir as a Plan B, but that doesn’t look like it’s going to work either. They meet from 7:00 to 9:00 p.m. on Mondays. He’d be shredded if he stuck to that schedule after a whole day at school and therapy. Plus, they were learning Handel’s Messiah, not a beginner’s choral piece. 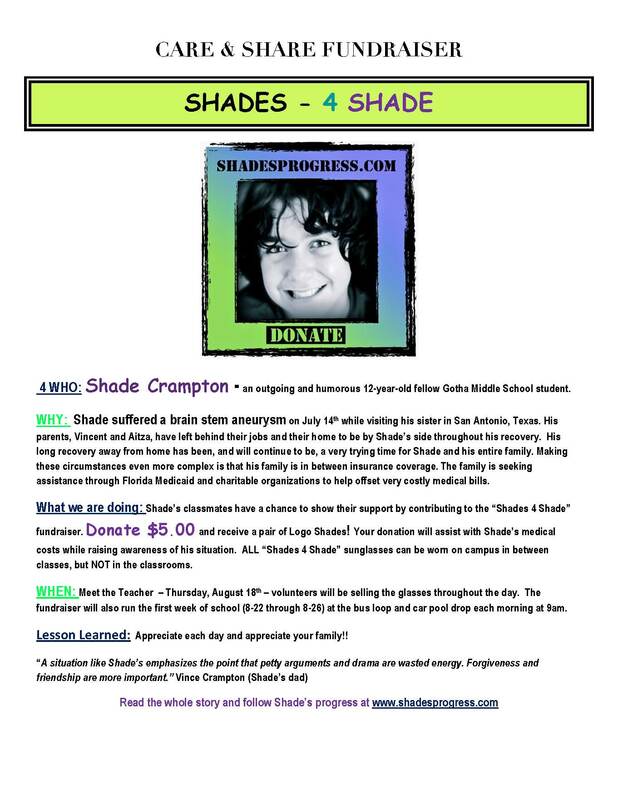 New news on Shade’s Super Stride 5K. It’s moving location. It’s still September 15 at 7 a.m. but it is now going to be at Blanchard Park off Dean Rd. between Colonial and University. Matt Libby (who happens to be the husband of Shade’s OT, Kristen), Executive Director of the Blanchard Park YMCA, is helping us with all the necessities including insurance and permitting so it’s a lot easier. The original location in Gotha became a bit of a nightmare, especially after we ran into the bureaucrat from Hades. Blanchard, though a bit farther, is much easier. We actually had a few people who stepped up to help us including Brian Nesmith, event coordinator for Race Time sports who gave us a lot of great advice. Thanks for the help, Brian. School approaches. Next week, Shade will start another challenging year of juggling his studies, therapy, doctor visits, and more. He seems cool with it. I’m starting to stress though. Summer has been a nice respite. This year, Shade is going to be in class for nearly the full time. It will be interesting to see if he can outlast the fatigue. Last year, he only did 4 classes in school. Guitar is out unfortunately. Shade doesn’t have the finger coordination still. In its place, he plans to take choir. So my plans to live vicariously through him switch slightly from lead guitarist of top-selling rock band to lead singer of top-selling rock band. Not a bad shift. At least he didn’t switch to flute. (No offense, Jethro Tull.) He’ll also be taking art, for which he has some passion and experience. (Thanks again, Julie!) I’d place him in the Salvador Dali camp. The boy is definitely surreal. This week we started planning for Shade’s Super Stride 5k Fundraiser on September 15. We’ll be walking, running or zipping through the bustling metropolis of Gotha. Click here for the Facebook invite, or you can just look on the Events Page right here on Shade’s Progress. We’ve got the map of the route on the page. Invite everyone you know. We’re looking for a few volunteers who have bad knees and don’t want to do the 5K but could help us with parking and to be makeshift crossing guards at the 5 road-crossing points. Send me an email if you can help. Shade’s Super Stride is a themed stride, so wear your favorite superhero (or villain) outfit. Capes, tights and colored underwear worn on the outside of clothing are all welcome. For those of you that are not extroverts, you can come as yourself because you’re super. At least your mom thinks so. Also, when you come, bring your smart phones and take pics along the way. We’ll have a site to which you can upload them all. I want to get 1000 pics of the event. We’ve put out a suggested $20 donation at the request of participants that need to see a number, but if you can’t afford that, it’s okay. Give what you can. And don’t let us limit you if you are itching to share your lottery winnings either. Proceeds will go to Shade’s therapy, tutoring, bills, and other expenses. We’ll keep you updated on the plans for the 5K as the time draws near. Happy anniversary to us. Shade has made it through a full year since the nuclear bomb went off in his brain stem. I would wax poetic on the emotional journey we’ve been on, or the growth we’ve seen, but that seems too corny. (Plus, I hate seeing growths. They’re disgusting.) Suffice it to say, I’m glad my family is safe and close. And I’m glad we have close friends. And I’m glad that throughout this traumatic affair, Shade has managed to remain a happy kid. What more could we want? I think the best way to express that happiness is with food and beverages. So we’re throwing a survival party today. All are welcome, so consider this an invitation. I tried to get as many emails on an Evite as I could but I always miss someone. Call me for directions if you need them. This Sunday, Aitza’s friend Loriel (sp?) who is a yoga instructor, came by the house to teach Shade some poses that will help strengthen his core and stretch out his tight muscles. They were basic poses meant to open up his chest area and align his spine. Shade was trying to work in his favorite pose, The Napping Cat, but Loriel kept waking him up. Combining the yoga with the YMCA exercises, his time in the pool, his new-trike rides, his house scooching, and his continued work at therapy has really helped his strength and balance in the last few days. He’s sitting with his chest out and shoulders back more than he used to (mostly because daddy keeps hounding him about it). Case in point: Today, after YMCA, we went to visit the Creus’ house to do some art with craft-legend Julie, or technically with her son and Shade’s friend, Liam, who like his mom is an artistic and engineering whiz. In fact, my buddy Billy Touza and I have both said that if the zombie apocalypse ever comes, we’d want Liam on our survival team. He’s the type that could rig up a water filtration system out of a handful of Legos, a coffee filter and a turkey baster. Today, Liam was teaching Shade how to make a BB gun — Oops, sorry Julie, I mean a plastic ball-bearing ejection device. We would never make or play with any of those destructive guns — out of a medicine bottle and a mechanical pencil, using just a drill and a glue gun. You blow through it to shoot the BBs. It worked great. I know because he machine gunned me in the back and it stung. But I get ahead of myself. Shade, Liam, his dad Santiago, and I were heading outside to try the (not actual) guns, and I helped Shade walk out by walking behind him and holding him lightly under the arms. We usually have to adopt a very close knit, regulated one-two, one-two pace so that we don’t trip over each other. Shade has discovered that this is the most hilarious times to rip a fart because I’m basically pressed against his back and can’t do much to defend myself. So, just as we get outside and stop, he cheeses one on me and starts his Beavis laugh, “Huh, huh. Huh, huh.” So I respond with, ” Are you kidding me? You’re on your own!” And I release him and take a small step back, keeping my hands very close behind to catch him as he falls. Except, this time he didn’t fall. He stood there, swaying, holding his arms out like a beginner surfer. He held his position for a good 10-12 seconds before he started leaning forward and I caught him. Meanwhile, we’re cheering and pulling out phone cameras. We made him repeat it a couple times so we could video it. Later, I had to leave, but Shade stayed with the Creus family to see Liam sing in his school choir. (He’s getting independent enough to hang with his friends without me now.) They had Shade performing his new trick multiple times, one time counting up to 35. Next trick, one foot hopping while balancing a ball on his nose. We aim high. Birthday boy Shade has officially entered the teen realm. He can now say he’s not a little kid anymore. It seemed somewhat subdued because we’re actually having his birthday party this Sunday. We gave him a card and a small Lego set this morning. (His big present is in the mail.) And the school mentioned his name in the announcements. And the trainers at the YMCA gave him a birthday card (very cool after only being there one week). But generally it wasn’t parades and confetti. The highlight of his day seemed to be having a few family over to wish him happy birthday this evening. He spent a bit of time with his cousins and played some video games. Not a huge celebration. But fun. I guess the teens creep in softly and then suddenly trumpet in the ears of anyone nearby, “Hey, I’m here!” I can’t remember if my introduction to adolescence was this way. Maybe the fact that I can’t remember it means it was that way. I’m still trying to reconcile the fact that Shade’s not my little boy any more. But I guess he never will stop being that cute kid running around and bumping into things. Especially now considering he’s relearning how to walk. Even so, I fear the teenage years. I’ve got a buddy who is an inspiration to me and anyone who meets him. He’s Gary Oakley, the Oak Man! He has completed numerous marathons, overcoming the challenges of cerebral palsy. A long time ago, I wrote an article about him, which you can read here. Part 1. Part 2. I hope someday that Shade will take Gary’s lead and inspire others to overcome obstacles. 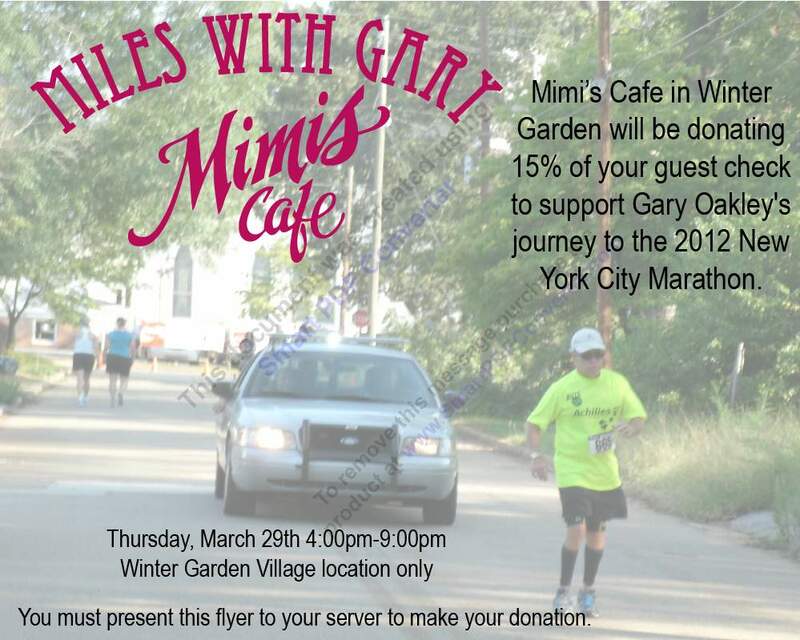 Print this flyer to take to Mimis. Click the pic to see a larger version of the Gotha Middle School's Meet the Teacher fundraiser for Shade.